Each part of the bracelets are all top stainless steel; No Rust; Not Allergy; Do not Fade; No deformation; Resistant to acid and alkali. 3rd: a good friend knows all your best stories, a best friend has lived them with you. Comes with a Free Jewelry Bag; Can Be a Great Gift. Gifts for Women, Ladies, Young Teen Girls, Sisters. Best friend Gifts for Birthday, Graduation, Thanksgiving Day, Christmas Day and so on. BEST FRIEND GIFTS: Side by side or miles apart, friends are always close at heart / Not sisters by blood but sisters by heart / a good friend knows all your best stories, a best friend has lived them with you. 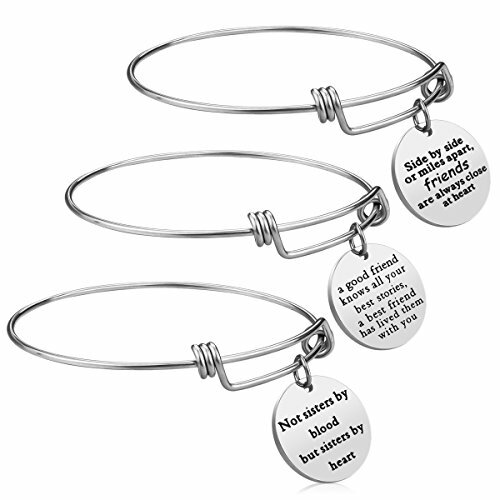 3PCS ADJUSTABLE BRACELET: Sold in set of 3 pieces best friend gift bangle set with different inspirational words; Adjustable and expendable. STAINLESS STEEL ONLY: All parts of the 3 bangles and charms are 100% stainless steel; No Rust; Not Allergy; Do not Fade; No deformation. GREAT GIFT IDEAS: Comes with a Free Jewelry Bag; Can Be a Great Gift for best friend , women, ladies, young Teen Girls, sisters, on Birthday, Thanksgiving Day, Christmas Day and Graduation. If you have any questions about this product by iJuqi, contact us by completing and submitting the form below. If you are looking for a specif part number, please include it with your message.